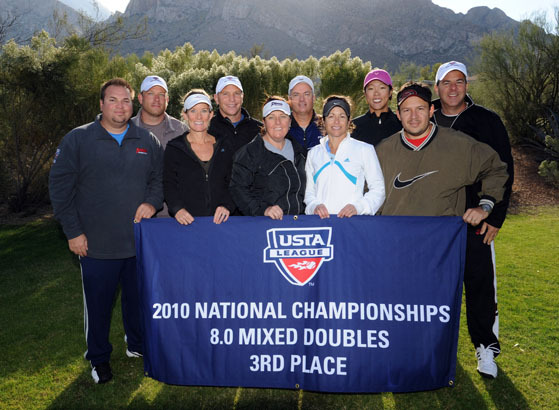 (TUCSON, Ariz.) (Nov. 21) – The mixed doubles team from Phoenix, Ariz., representing the USTA Southwest Section, finished third at the USTA League 8.0 Adult Mixed Doubles National Championships held at the Hilton El Conquistador Resort in Tucson, Ariz., from Nov. 19 to Nov. 21. The Phoenix team lost to a team from Dallas, Texas, 2-1 in the semifinals on Saturday, but rebounded for third place, defeating a team from Memphis, Tenn., 2-1. The Phoenix-area squad had advanced that far by going a perfect 3-0 in their round-robin flight contested Friday and Saturday. The team is captained by Aaron Gomez and features Steve Bishop, Stuart Finn, Barry Norton, Carlos Rivas, Scott Peltin, Karen Peltin, Jacqui Pinkham, Amy Rhoden, and Kristin Morgan plays out of the Phoenix Tennis Center. The top four teams in order of finish are: Texas, Northern California, Southwest and Southern. This year’s USTA League 8.0 Adult Mixed Doubles National Championship had drawn the top 16 teams from throughout the nation.